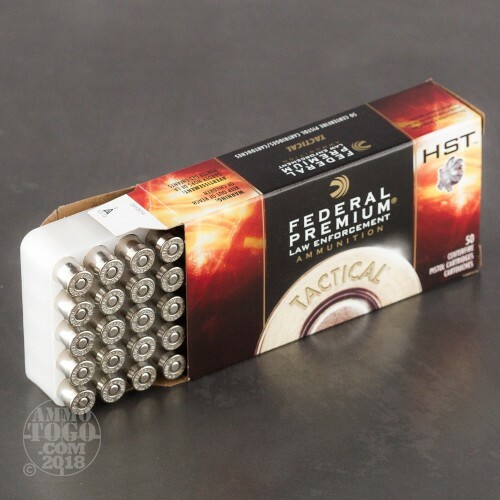 Federal's HST series is designed to pass the rigorous standards of law enforcement users, producing optimal expansion and penetration to stop threats to life and limb. This means that it is also an excellent choice for concealed carry use. 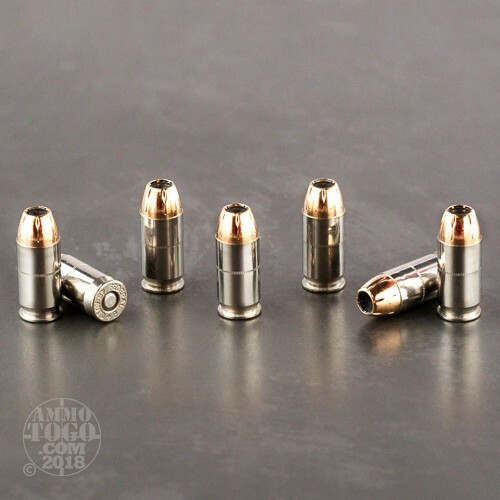 Each .45 ACP cartridge in this case of 1,000 fires a 230 grain jacketed hollow point bullet with a specially cut "skived" tip that expands into a six-petal shape for maximum terminal effect. 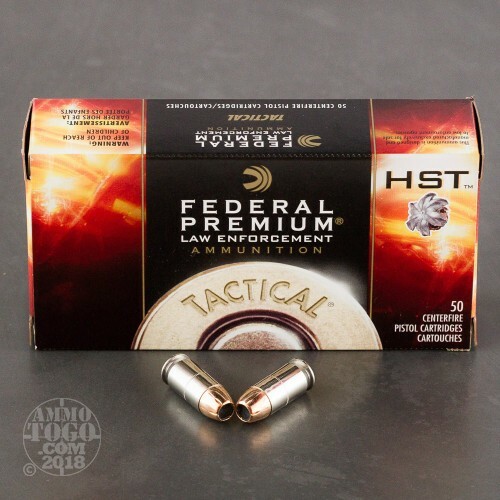 This ammo is made in Anoka, Minnesota and uses non-corrosive Boxer primers and nickel-plated brass cases designed to withstand long periods of daily carry without losing their integrity. In hopes of giving ourselves and our customers a better idea how this 45 ACP (Auto) self-defense ammo would perform if called upon in a self-defense scenario, we tested dozens of the best selling hollow points on the market. We fired five rounds of this Federal Ammunition 45 ACP (Auto) ammo through a cloth barrier into Clear Ballistics calibrated synthetic gelatin and recorded the results. For these tests, we used a Ruger SR45 with a 4.5-inch barrel. 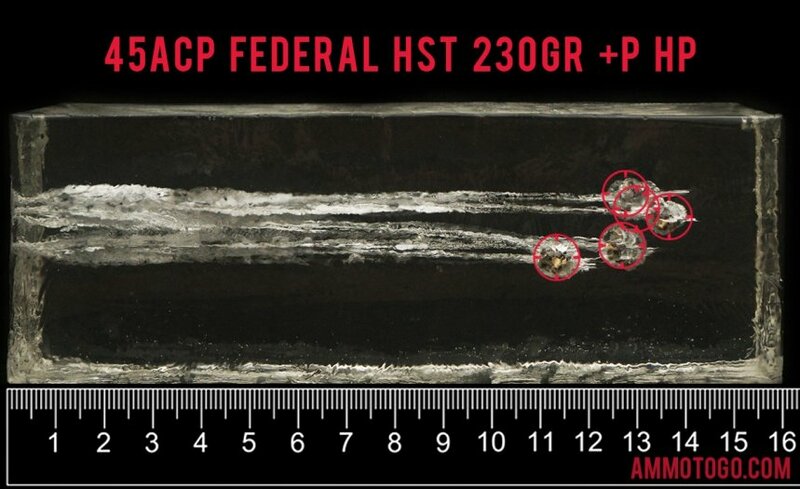 In the photos, graphics and video on this page, you can see specifically how the Federal Ammunition ammo performed and how it sticks up with the rest of the 45 ACP (Auto) ammo we have tested so far. 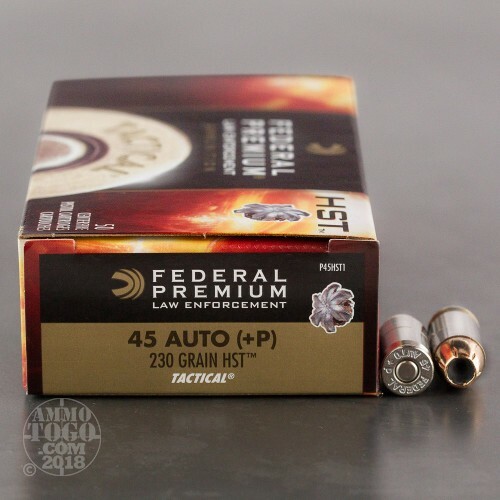 How do the results for this Federal Ammunition 45 ACP (Auto) compare to other 45 ACP? Expansion Diameter Compared to All 45 ACP (Auto) Ammo Tested MIN 0.45" MEDIAN 0.64" THIS AMMO 0.85" U.S. dime MAX 1.04"
Penetration Depth Compared to 45 ACP (Auto) Tested 0" 10" 20" 30" MIN 8.3" MEDIAN 16.7" THIS AMMO 13.1" MAX 32"